My dad Glassell Stringfellow died March 19, 2005 In Denver, Colorado. the Korean War. But will certainly contribute anything we may learn. 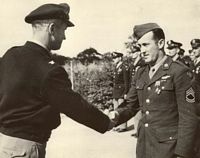 On a tea break is the CO of the 714th Bombardment Sq and his Executive Officer (Adjutant) Jim Chancellor.There must be a plate of Crumpets nearby. 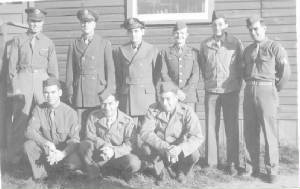 Below is a picture of Stringfellows Crew or OR staff-- at Sioux City IA in 1943. Are you pictured or do you know anyone in the picture. Wendy may be contacted at Wwschmoyer@aol.com or inform me at webmaster link below. Wendy Schomoyer would appreciate contact with anyone who knew father. 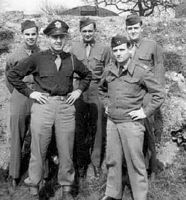 His name was Everett G. Barry ASN32761512.Inducted 2/1/43 and was discharged 10/7/45.He was an Administrative Specialist.He departed for the ETO 11/23/43 and arrived 11/29/43. She would like to know what the sign at their head said. I recall we were the only Squadron that had a sign. I have forgotten the reading but assume it had something to do with the 714th Hdq. Wwschmoyer@aol.com or webmaster link below.